I posted these chaps in primer earlier in the week and I did just last night get them finished up, so I thought they could be the Monday post. Hammernator 1, lovely dynamic arms and poses, they have clearly learned a lot from the space hulk guys.. Brother Bling here really, really likes the Wing motif. Hammernator 2, the least dynamic, but still full of character, which isn't easy for a guy in a helmet. And the sarge. Not sure if its the sculpt or my paint, but he looks like he wants to ask a question. At some point I have about five guard units to finish, I have a number of boxed games to paint, I have a brand new project ready to go, some Americans to paint, and the space wolves to align to the new codex and get some paint onto. Sgt: How me itch nose like this? HOW?! Yeah, there's totally no way he's getting that scratched. Looks great. You're really churning through this lot. 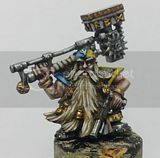 Hammernator 2 is my favourite one of the lot I reckon. There is the right amount of bling and other dodads hanging about him. I'm quite fond og him too, - these guys have a lot of bling, it's one main difference i've noticed between these and other marines, even the wolves. Perhaps the Emperor's Children and Luna Wolves could scratch his nose ? Very helpful of the brother legionnaires i'm sure. Jeepers, Mate - that really was swift! I'm also working hard with this bunch to sneak in a hour here and there during the week to keep unit completions ticking over. Great red and metallics, great subtle details and highlighting on the weapons. They look great!